Broad spectrum UVA/UVB Light Day Moisturizer offering high protection from photo-aging. bottle that ensures the efficacy and prevents the formula from losing its activity. 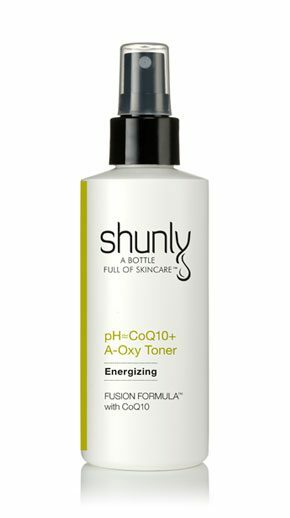 This innovative non chemical filters sunscreen FUSION FORMULA® featuring 20% Zinc Oxide is part of Shunly Skin Care; 3 SkinCareActs™ system and offers high PROTECTION level (SPF40) to skin. This unique formula is designed for even the most sensitive skin types as it utilizes our number one rated physical sunscreen filters to help defend skin against free radical production, prevent collagen breakdown and premature aging of the skin. Our single sunscreen filter offers a soft, silky and elegant texture that absorbs quickly while providing superb photo protection. Apply generously to cleansed, toned and hydrated skin, pay special attention to sun exposed areas. Place one pump to hand, apply to skin by using finger to make a lot of dots over the face, neck and body then by using finger to tapping motion (do not apply like cream) and deliver the sunscreen into the skin. Re-apply if active, sweaty, or after swimming. very nice and smooth and it doesn`t make my skin shiny doing the day. Love it! normal sunblock leaves my skin with a sticky feel to it which makes my make up cake on. sunscreen to it and I feel very good to knowing that my skin are well protected by it. ever. I just love it. Thanks to my friend. in the snow frequently, so my exposure to winter winds and sun can easily dry out my skin. cleared up. Definitely worth the investment if you are outdoors a lot. Thanks Shunli!! kept my skin stay healthy without aging. I never go out without this sunscreen on my face. I love this sunscreen. Other products are too heavy for my face. I use it every day as my base layer of moisturizer/sunscreen. It makes my skin feel smooth and not greasy. No better sunscreen than this! I use this sunscreen after my Shunly antioxidant serum and I no longer need any moisturizer but my make-up. My skin felt much better without feel greasy. I have not seen any new aging spot on my face in two years. Great sunscreen are hard to find but you know it when you use it. I started using this product about 2 months ago. It is AMAZING!!! I use it with the PH SE + Nutri toner and the CE + Ferulic Treatment. What can I say….my skin feels more firm and I am no longer wearing make up because it appears to me that my face has been uplifted. I work in the mountains. My skin is exposed to snow, wind, extreme cold, extreme warmth, sun and sometimes if I am on a backcountry assignment…days without a shower. This set is excellent for me and although I haven’t quite figured out how to pack them in my backpack efficiently, I would not leave without them. Especially the sunscreen. NO greasy feeling. Light with good coverage. 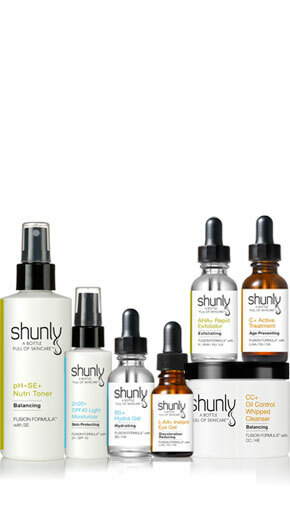 I love these products and I really value ShunLy as my skin advisor. I will never go back with any sunscreen from department store. After many research about the sunscreen I learned that if you’re looking for an sunscreen that will WORK you need to check the active ingredients listed with physical ingredients such as Titanium dioxide and zinc oxide not with chemical ingredients. The chemical sunscreen are going to absorb the sun-rays rather than block/reflect them off the skin and actually irritate the skin. No wonder my skin break-out with many sunscreen before and never with this sunscreen. This sunscreen has 20% of zinc and no oil ingredients like many other sunscreen I used in the past. I never break-out, irritate with this sunscreen. I used all the Shunly skin care products and my skin no longer break-out, irritated or pigmented from the sun. It has cost me more to use this product line but over all it actually cost me less because I no longer need additional products to treat my problem skin like I did before. If I could give this sunscreen 10 stars I would! This is the BEST sunscreen I have ever used for my face!! I was reluctant to try this sunscreen/moisturizer as I have always been very sensitive to sunscreen on my face. Most make me breakout, leave my skin shiny and oily, and then to top it all off make my eyes water all day. This is the first and only sunscreen that I have used that doesn’t do any of that. I apply it after my CE+ Ferulic Serum in the morning as a light moisturizer and it protects my skin perfectly…no irritation, no oily or shiny residue, no breakouts or bumps….my skin looks and feels perfect! This sunscreen not only feels great, but works great too! I can go out all afternoon golfing, and my face doesn’t burn or get pigmented from the sun like it used to. I love knowing I can be confident wearing much needed sunscreen on my face everyday, without all the chemicals and side effects I used to experience with all the others I have tried. Best ever! Thank you Shunly! This is a light moisturizer you can wear under your makeup or alone. It has excellent sunscreen to protect your face and leaves a nice pretty glow. I love it. i have used MANY different sunscreens and this it the best one i have ever used. i will never use anything else. this is the first one i have used that dosent make me oily and make all my makeup come off. this product is also an amazing primer for your makeup. my make up looks fresh and like i just put it on 10 hours after applying! amazing product! I have very acne prone skin, and often experience a stinging sensation when I have worn other facial sunscreens. I have used this sunscreen for almost 1 yr now and have never experienced any sting (even with a cut on my face) and have not had any acne be caused by it. I wore this sunscreen while running a half marathon and did not burn at all. I did reapply at mile 8, due to sweating, and loved how easy it was to blot off and quickly reapply. It is very light and works as an awesome base for your makeup. I’ve been looking for a good SPF for years now, and now the search is finally over!! I love this product because it has no harsh chemicals that can hurt my skin, it feels light, it leaves a really nice shiny glow on my face and I feel protected at all times while outside under the sun. Love this sunscreen! I use it on myself and my toddler. No harsh chemicals and is light on the skin. Love it! I love love love this moisturizer… it protects my skin and doesn’t clog my pores! I have spent thousands and thousands of dollars and tried every skincare line you could imagine. I will never use anything other than Shunly products again! They are amazing! This is the best moisturizer/sunscreen combo I have ever used- lightweight, long-lasting and quality! I feel protected without feeling weighed down or sticky, especially having combination skin. I have used zinc sunscreens before but they left my face feeling sticky and white. This goes on smoothly and blends into skin easily.